Yesterday, workers at various campuses of the University of California (UC) walked out for a one-day strike, their fourth job action in twelve months. Contracts between the university and two workers’ unions expired in 2017, and the parties have been unable to successfully negotiate a renewal since then. To add insult to injury, say the unions, the university system has engaged in unfair practices to discourage workers from participating in strikes and other union activities. Part of the negotiation issue is pay; the workers want a yearly 5.5 percent increase over the next four years, and the university offered three percent plus a one-time, $750 lump payment. 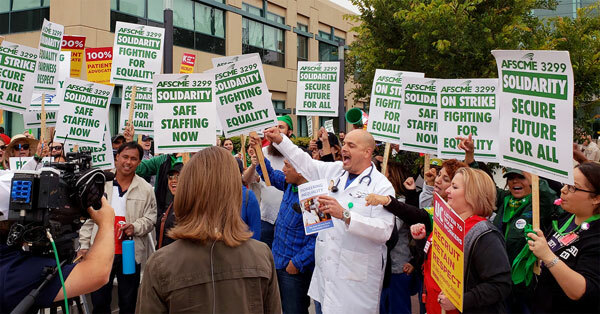 The union, the (AFSCME) Local 3299, represents about 24,000 workers from UC’s five academic hospitals. University Professional and Technical Employees-Communications Workers of America (UPTE-CWA), Local 9119’s 15,000 members approved a strike in solidarity with AFSCME. Another significant point of contention, which has so far gone unaddressed by UC, is the hiring of contract workers. Many workers fear that increasing use of contractors, who are paid less than full-time employees, will put them out of a job. Now, says the union, the university has violated labor laws in an attempt to stymie protests. “Through illegal actions, UC has trampled state law and created an unwelcoming workplace that undermines workers’ ability to exercise their rights,” said Kathryn Lybarger, the president of AFSCME Local 3299. Supervisors have rewarded unionized workers who cross the picket line with free meals and even a pool party. Management attempted to force out a UC Merced custodian who serves on the union’s bargaining committee by reprimanding her union activity and dealing out unfavorable work assignments. The worker took an unpaid leave, citing work-related stress. In a private meeting, a UC San Diego supervisor encouraged workers to “give themselves a raise” by opting out of AFSCME membership. Various UC representatives have attempted to instill fear in union members with physical confrontation. At the time of the original strikes in 2018, Chris Brooks at Labor Notes pointed out how much harder workers of color were hit by the university’s employment practices. An AFSCME study noted that not only did administrative salaries rise between 2005 and 2015 as lower-level employees’ salaries fell, but also the proportion of Black workers fell 37 percent between 1996 and 2015. “As we get better wages and protections, they don’t hire African American workers, but young white people,” said Maricruz Manzanares, a senior custodian at UC Berkeley. Could there be a broader lesson in a current strike over authorship for actors and stage managers working in “labs” that lead to future Broadway plays?